Who is Saving our Songbirds? Join Willem Lange as he takes us from New England to Costa Rica and Jamaica to meet these colorful and melodic migratory birds and the people who are dedicated to SAVING SONGBIRDS. Saving Songbirds, a NHPTV Windows to the Wild special, introduces viewers to researchers who employ creative means to assess the health of bird populations, and grassroots efforts by Vermont school children to help re-forest the mountains of Costa Rica. Also featured are scientists in Cape May, NJ, who track large flocks of migrating songbirds in total darkness, and Costa Rican coffee farmers practicing bird-friendly methods of cultivation and processing. Avid bird watchers Samuel Habib and Andrea LeBlanc show the personal side of why the survival of songbirds is so important to us all. The work of MDI and UMass students are featured in the documentary produced by Phill Vaughn with videographer Steve Giordani. 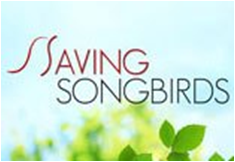 Saving Songbirds has won two Bronze Telly Awards, which honor the very best film & video productions, groundbreaking online video content, and outstanding local, regional, & cable TV commercials and programs. Saving Songbirds is honored in the in the Nature/Wildlife category as well as Videography/Cinematography.